Hi there fans of our podcast! You may have noticed that July 15th came and went and we didn’t post a podcast. Yeah. We’re sorry about that. Things got pretty busy with CONvergence and putting together a fringe show and we just weren’t able to sit down and record. Here’s the good news, though – we’ll be back on August 1st with a podcast about Jackie Brown! Do you need more Reel Education? Do you lament that you only get two Reel Education episodes per month? Do you long for more episodes about movies that feature lots of guns and fedoras and rain and shadows from Venetian blinds? New episodes of the new podcast arrive on the 7th and 21st of the month, which means if you subscribe to both A Reel Education and A Reel Education: Noir, you will get new cinema talk poured into your ears every week or so. So grab your whiskey and your favorite goon and head on over to ReelEduNoir.com! A Reel Education LIVE on December 21st! 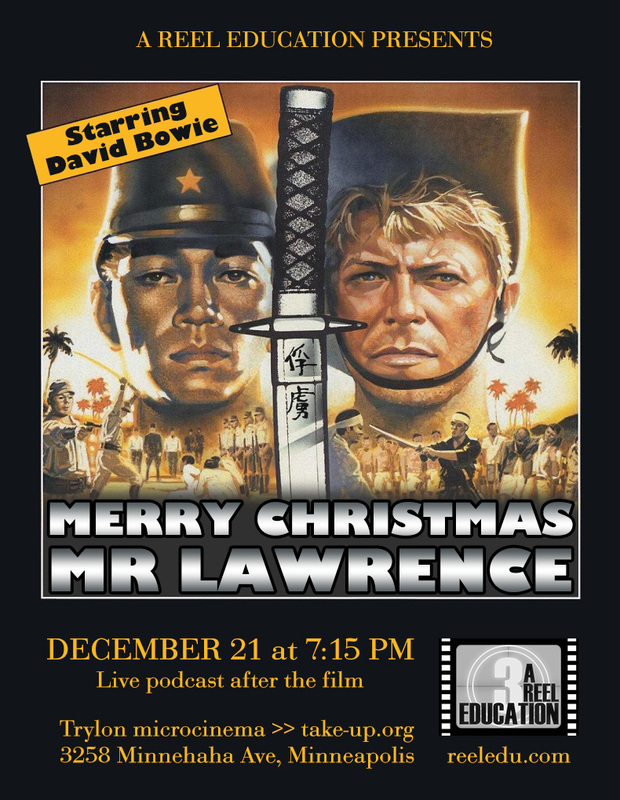 A Reel Education is pleased to return to The Trylon Microcinema on December 21st! 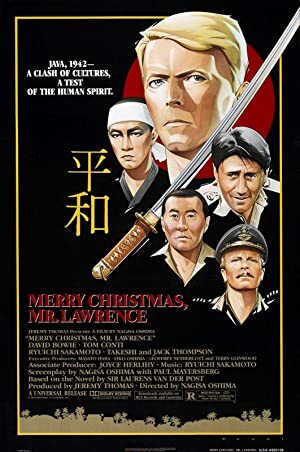 This time, we will be presenting David Bowie content, by way of a screening of the very weird POW camp drama, Merry Christmas, Mr. Lawrence! A Reel Education LIVE on November 30th! A Reel Education is pleased to return to The Trylon Microcinema on November 30th! 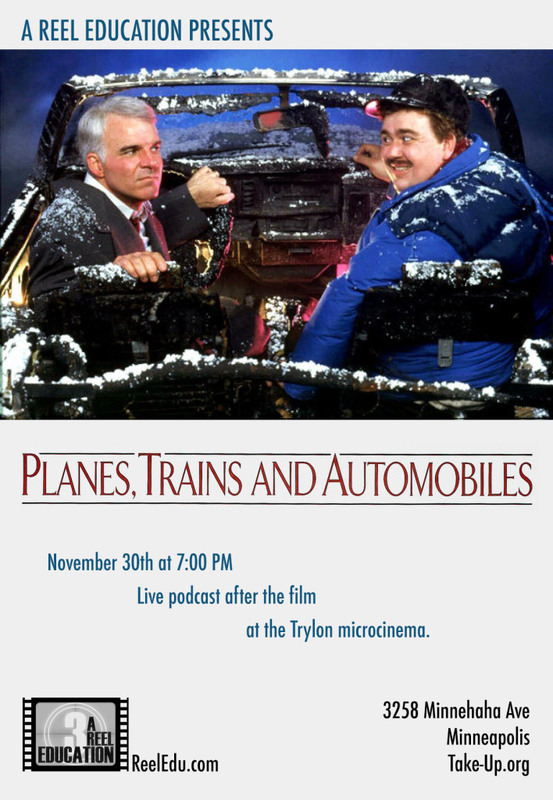 This time, we will be presenting the Thanksgiving classic comedy, Planes, Trains, and Automobiles! Film starts at 7:00 PM. Podcast will be recorded immediately after the film. 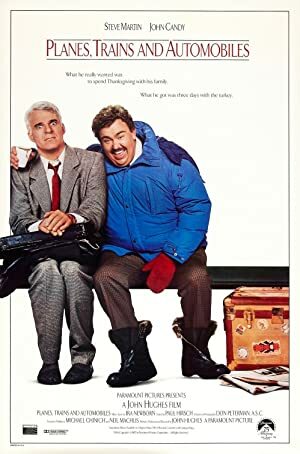 Plot: A man must struggle to travel home for Thanksgiving with an obnoxious slob of a shower curtain ring salesman as his only companion. A Reel Education LIVE on July 20th! 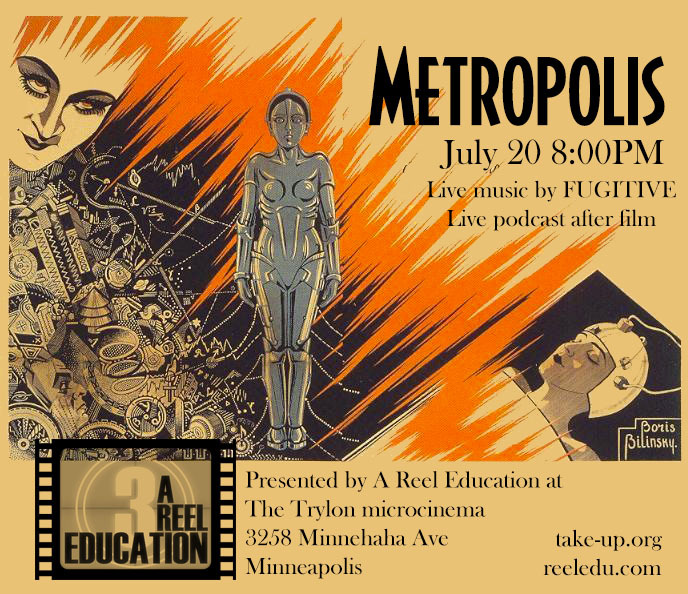 A Reel Education is pleased to return to The Trylon microcinema on July 20th! 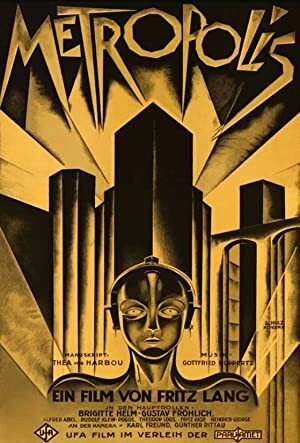 This time, we will be presenting Metropolis, the very first feature-length science fiction film. As an extra treat, this silent classic will be accompanied with live music by FUGITIVE! 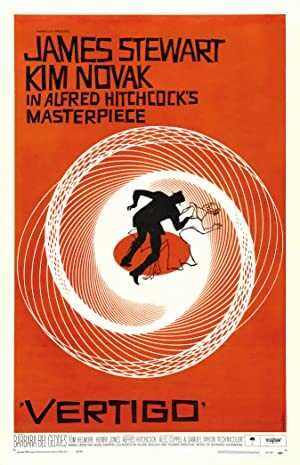 Film starts at 8:00 PM. Podcast will be recorded immediately after the film. Plot: In a futuristic city sharply divided between the working class and the city planners, the son of the city's mastermind falls in love with a working class prophet who predicts the coming of a savior to mediate their differences. A Reel Education LIVE on May 4th! A Reel Education is returning to live shows, starting on May 4th! 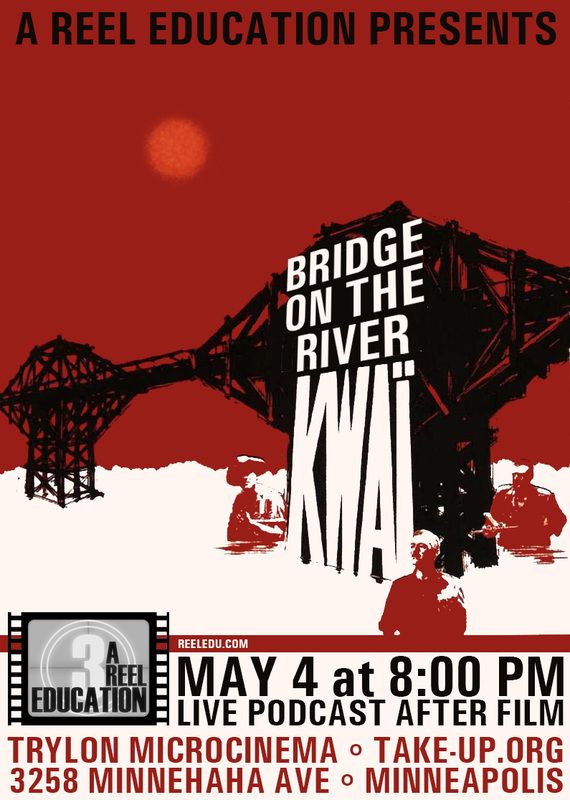 This time, we will be at The Trylon Microcinema, where you can join our live recording session, which comes after a screening of the Alec Guinness classic, Bridge on the River Kwai! We are excited to introduce you to our new venue, The Trylon. The Trylon Microcinema is a wonderful, intimate non-profit theater in South Minneapolis, whose focus is on rare, classic, and unusual films. Plot: After settling his differences with a Japanese P.O.W. 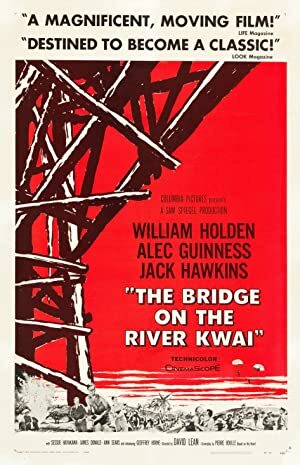 camp commander, a British Colonel co-operates to oversee his men's construction of a railway bridge for their captors, while oblivious to a plan by the Allies to destroy it. A Reel Education LIVE on January 18th! Once again, A Reel Education will be recording an episode LIVE at the Parkway Theater! 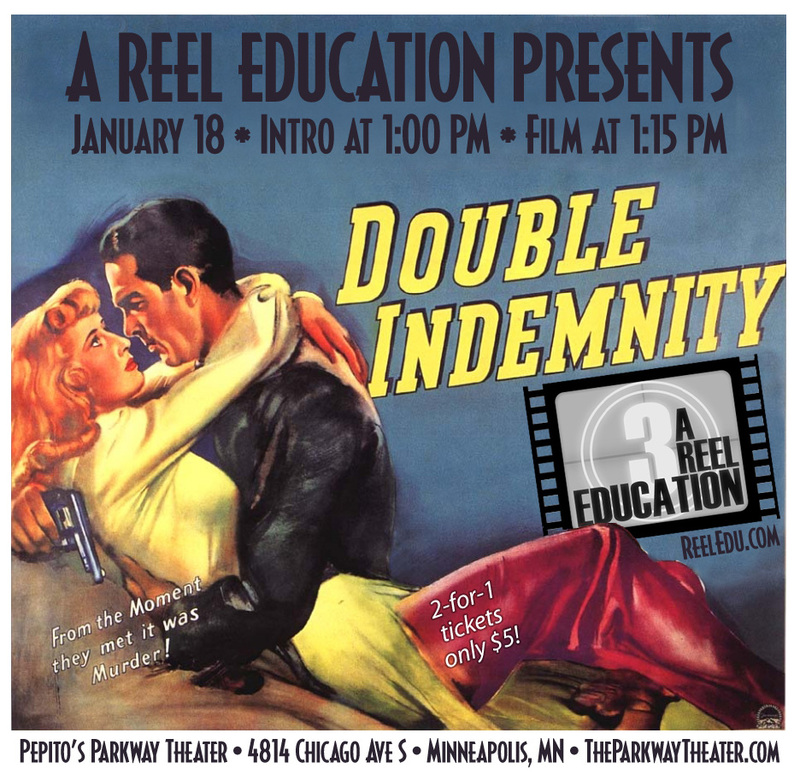 On January 18th, you can join our live recording session, which comes with a matinee screening of Billy Wilder’s perfect film noir, Double Indemnity! Not only are tickets a mere five bucks, but if you bring a friend… they get in FREE! That’s right! 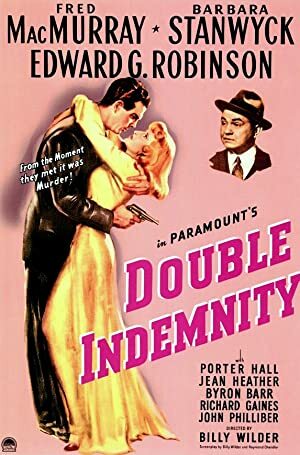 It’s a 2-for-1 deal where you and a buddy can enjoy the glory of Double Indemnity on the big screen for five measly dollars! In addition, The Parkway Theater is a great venue in the heart of South Minneapolis. The theater is partnered with Pepito’s, the Mexican restaurant next door, so you can actually eat Mexican food and drink beer in the theater. Intro at 1:00 PM, film at 1:15 PM. 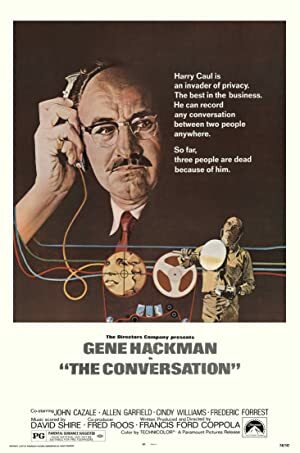 Podcast continues after the film. A Reel Education LIVE on December 14th! Once again, A Reel Education will be recording an episode LIVE at the Parkway Theater! 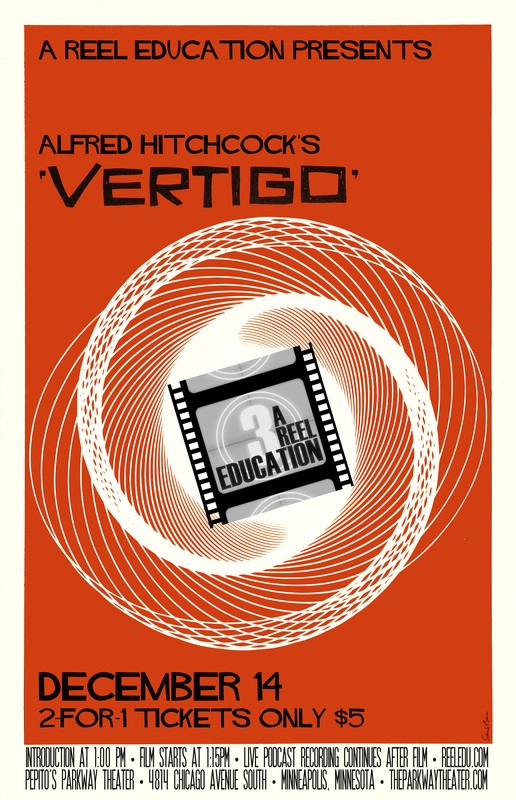 On December 14th, you can join our live recording session, which comes with a matinee screening of Alfred Hitchcock’s brain-twisting thriller, Vertigo! That’s right: Jena liked our last Hitchcock outing so much that we couldn’t resist giving her more! Not only are tickets a mere five bucks, but if you bring a friend… they get in FREE! That’s right! It’s a 2-for-1 deal where you and a buddy can enjoy the glory of Vertigo on the big screen for five measly dollars! Plot: A former police detective juggles wrestling with his personal demons and becoming obsessed with a hauntingly beautiful woman. 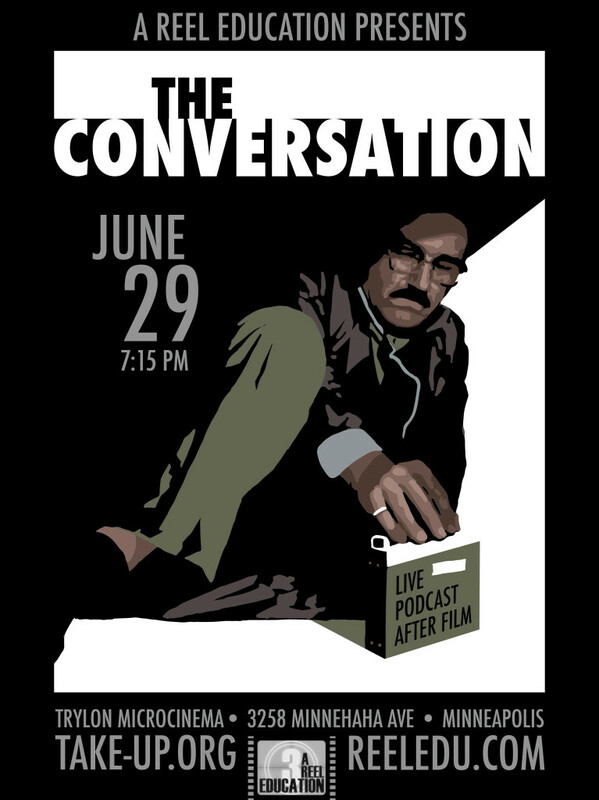 Once again, A Reel Education will be recording an episode LIVE at the Parkway Theater! 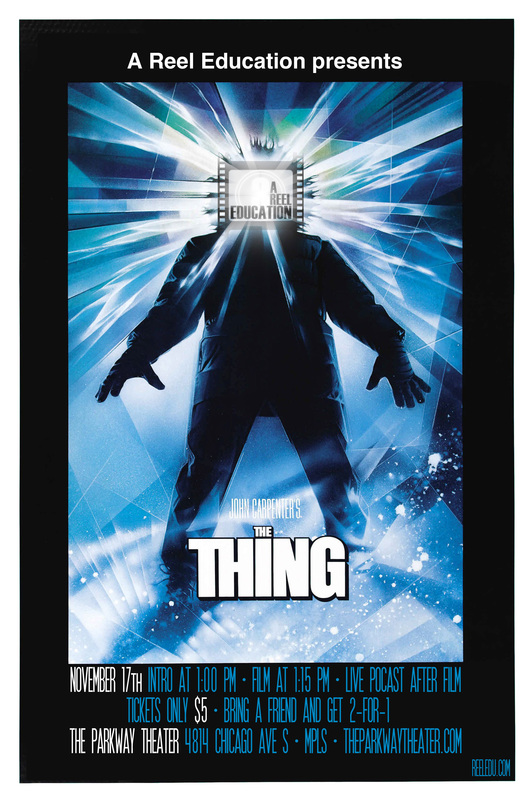 On November 17th, you can join our live recording session, which comes with a matinee screening of John Carpenter’s gooey horror thriller, The Thing! That’s right… Reel Education is getting Kurt Russelled! Not only are tickets a mere five bucks, but if you bring a friend… they get in FREE! That’s right! It’s a 2-for-1 deal where you and a buddy can see The Thing on the big screen for five tiny dollars! 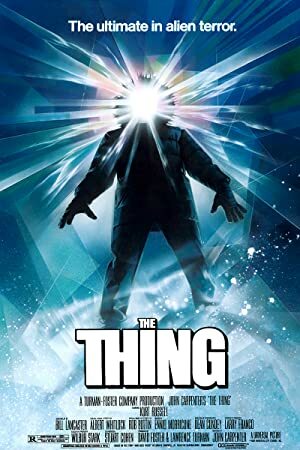 Plot: A research team in Antarctica is hunted by a shape-shifting alien that assumes the appearance of its victims.